Welcome to this beautiful town house with private pool and room for 6 people. It is located in the centre of sa Pobla. This house with private pool and garden is set in Sa Pobla, a few kilometers from the sea and the mountains. It can comfortably accommodate 6 people. This cozy town house with private pool in Sa Pobla offers accommodation to 8 guests. Enjoy the peace of the countryside in this beautiful newly constructed house on the outskirts of sa Pobla. It has an impressive private pool and garden and capacity for 10 guests. 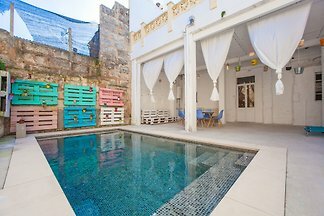 This authentic townhouse with a private pool and a terrace in Sa Pobla, in the north of Mallorca invites 4 guests. Welcome to this incomparable villa with private pool in Sa Pobla, where between 10 - 12 guests can enjoy a completely unforgettable stay. This modern terraced house in Sa Pobla features a private pool and is ideal for couples as it offers accommodation to 2 guests. A few kilometres from the coast, this impressive finca with private pool and garden in Sa Pobla is ideal for 6 guests. Welcome to this fantastic villa with swimming pool, very near to Sa Pobla, that can adequately accommodate 6 people. Traditional Mallorcan country house with nice private pool in Sa Pobla for 8 people. Fantastic 5-Bedroom Villa with private swimming pool and terrace. Welcome to this attractive villa on the outskirts of Sa Pobla. It sleeps 6 people. This beautiful house with private pool, situated in Sa Pobla, welcomes 5 people. Exceptional house in the outskirts of Sa Pobla with private pool and capacity for 6 guests, a 15 minutes' drive from Playa de Muro beach. This bohemian villa, formerly inhabited by an artist and painter, located in the area of Sa Pobla, welcomes 8 people. 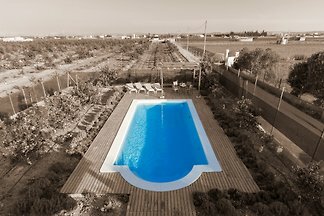 Wonderful rustic villa for 6 people, with private pool, located in Crestatx, a beautiful urbanisation belonging to sa Pobla. Rent successfully your holiday flat or holiday home in Sa Pobla in only 20 minutes !